Have a question on Golf? Golf is available in 2 different colors - Yellow and Blue. Watch latest video reviews of Volkswagen Golf to know about its interiors, exteriors, performance, mileage and more. Living a long life is not as good as living a long successful life. 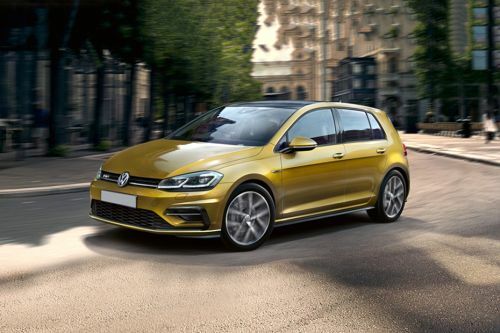 The renowned and prestigious German automaker proves the statement right with its every desirable successor, one of this is the Volkswagen Golf. The car is a small family car, which took its first breathe in 1974, when the company first produced it for this successful long run. The car shines high with its outstanding tag as one of the best-selling cars of all times. The car presently runs in its seventh generation and uses the new MQB platform, shared with third-generation Audi A3, SEAT Leon and Skoda Octavia. Throughout the history, the Volkswagen Golf has received several awards such as Motor Trend's 2015 Car of the Year, World Car of the Year in 2013 and mostly every generation has been marked as a runner-up in the European Car of the Year awards. This hatchback car is made available in an exclusive range of variants in UAE market such as New Golf, Golf GTI, and Golf R Variant. The latest Golf variant comes in three sub-variants: the Golf S, Golf SE and the Golf SEL variant. The car is crafted with an utmost perfection to make it presentable according to the trend, which is demonstrated by its stylish and modern front design and sporty rear look. The life pumping power plant fitted in the 3-door Golf hatchback comes in two options- the 1.2 Litre TSI engine for the Golf S and SE variant and the 1.4 Litre TSI engine for the Golf SEL variant. The more powerful 1.4 Litre variant churns out a maximum power output of 140 hp at 5000-6000 rpm coupled with a maximum torque output of 250 Nm at 1500-3500 rpm. This engine hugs a 7-speed dual-clutch gearbox, which provides smooth transition between the gears. Coming over to the interior design of the car, the car feeds its occupants with a large amount of comfort and convenience presented in the form of luxury and the driver is offered with an immense driving pleasure with the precisely-configured control and infotainment panel. The elegant hatch also takes the responsibility of the safety of its occupants with the functional and dependable safety kit consisting of Anti-lock Braking System, Electronic Brake-force Distribution, stability assists and the airbags and seatbelts. As depicted earlier, the Volkswagen Golf is lot more than the hi-tech hatchback car that shows its features in such a way that makes your ride comfortable and imposing. With well gained features and materials, the Volkswagen Golf shows off extremely comfortable and rejuvenating appearance from inside. As soon as you head into any of the variants of Golf you will learn how sophistication can be defined correctly with interior design. The “Piano Black Mesh” dashboard is finished with high quality plastics along with the driver's delight, the purely ergonomic and compact control panel with the Electro-mechanical steering rack, leather trimmed three-spoke multi-function steering wheel and a soul intuitive 5 inch color pro-touchscreen along with navigation system at the center that surely makes the driver feel the pleasure of authority while driving. The interior designers have done an impeccable job by crafting an ultra-perceptible interiors for the honorable occupants of the car. The hot hatch features a huge amount of comfort with the well-padded seats, lumbar and height adjustable front sports seat and split folding rear seat backrest, center console integrated with storage box and front armrests, carpet mats at front and rear and ashtray in front. The interior ambience ornating features are the purely efficient 2 Zone electronic air conditioning system, heat insulating rear tinted glass, ambient rear lighting and superior quality sound system that lets you enjoy your favourite genres. All this comfort gifted to the passengers and the driver looks more appealing in the soothing interior lighting. The good use of interior space and long wheelbase makes all the Golf variants capable to transport four or six-foot passengers. Despite its short body, the Golf has decent boot space has a volume of 380 litres which can be extended to 1270 litres when rear seats are down. The Volkswagen Golf is equipped with latest composition media system that comprise a 5 inch color touch screen, DAB digital radio receiver, single CD player that is mounted with glovebox, MDI (Multi Device Interface) with iPod connection cables along with the new generation lightening to 30-pin adapter, and SD card reader. The installed stereo system with 8 speakers (both front and rear side) facilitates music from MP3,WMA and AAC files and features. The impressive Composition Media System, but with some additional features enables you to manage music as well as navigation data, and a broad range of vehicle information. All of these features are standard for all the variants of Golf except Volkswagen Golf GT. The latest Volkswagen Golf hatchback comes with 3-door model. The exterior designers have made the car to feature a lot more amazing and modern appearance with its seventh generation model. The hot hatch is crafted with an angular floating bonnet design, dazzling Bi-xenon headlamps, sleek grille design crowned with the company's logo and the simple and well-curved front bumper, which collectively gives the car a sophisticated and modern front look. The other accentuating features hinting the sportiness of the hatchback are the expressive side lines, which indicate the aerodynamics installed in the exterior designing, the side-body lower sills, the rear spoiler, stylish rear lamps and the wide rear bumper. The expressive exterior design appears more appealing with employed mirror packs including electrically foldable door mirror, and the well-designed 15-inch and 16-inch wheel designs. This hatchback of Volkswagen has definite dimensions that gives it a extravagant appearance. The total length of the car is 4255 mm, with a width of 1790 mm and a height of 1452 mm. The wheelbase of the car measures 2637 mm which makes the car quite spacious inside. The smooth and unadulterated driving experience Volkswagen Golf displays is also a product of its tough and dependable wheels with comes with a well-designed rim in 15” and 16” size, which further adds to the aestetics of the car. The tyre that hugs these wheels have dimensions imprinted on it, which reads 195/65 R15 for the 15-inch wheel design. The most efficient variant of Volkswagen Golf in terms of mileage and fuel economy is the Golf S variant and Golf SE variant, which is poured-in power by a 1.2L engine. This well-cultivated engine extracts energy from each drop of oil to buy you a mileage of 4.8 Litres/100km. Volkswagen Golf has been at the top of the heap with its new design turbo-petrol and turbo-diesel engines. It is embedded with two engine variants for the UAE markets, namely the 1.2-Litre TSI (Turbo fuel stratified injection) engine variant and the 1.4-Litre TSI engine variant. Among this the powerful 1.4-Litre variant, which pumps-in life in the Golf SEL variant pours down a maximum power of 140 hp at 5000-6000 rpm and a torque output of 250 Nm at 1500-3500 rpm. Collectively with this engine and the 7-speed dual-clutch gearbox the car gains itself an ability to attain a speed of 100km/h from stand-still in just 8.4 sec. Along with these power and torque values the hatchback lists itself under high fuel economy car list with a mileage of 5 Litres/100km. Embedding two engine variants, Volkswagen golf car is turbo charged and delivers amazing performance in terms of power. The 1.2 litre Blue Motion petrol variants in the Golf S and Golf SE variant manages to fetch you a power output of 105 hp at 5000 rpm along with a torque output of 175 Nm at 1550-4100 rpm. While, the most powerful Golf SEL variant gulps down the power fed to it by the 1.4 L Blue Motion engine variant, which churns out a maximum power output of 140 hp at 5000-6000 rpm and a torque output of 250 Nm between 1500-3500 rpm. The acceleration value of the hatchback allows the car to be called as swift. The 1.4 -Litre TSI engine of the SEL variant is meshed with a 7-speed dual-clutch gearbox, which provides a butter-smooth transition between the gears to fetch the car a speed of 100km/hr from naught in just 8.4 sec. Most of the versions of Golf are amazing to drive. The precisely-responsive steering wheel and string management of suspension combine a comfortable ride with good body control. The Volkswagen Golf has electronically controlled Anti-lock Braking System (ABS) along with electronic brake-pressure distribution which apply a well-adjusted braking pressure to the car wheels in order to maintain a desirable vehicular control. Furthermore, the Golf variants are enclosed with diagonal twin-circuit brake system with ventilized front disc brakes and rear disc brakes, asbestos free brake pad and hydraulic brake assist to increase braking pressure at the time of emergency. The hatchback ensures the safety of its occupants with a well-configured and functional list of safety features. The latest Golf comes with standard safety features including quality stability control, 4-wheel anti-lock disc brakes and seven airbags: 2 for front, 2 for rear, 1 for the driver’s knees, 1 for the head and 1 for the driver’s right side, and all of these airbags are added to ensure security and peace of mind driving. The post-collision braking system (which is used to apply the brakes at the event of secondary accident) and a tyre-pressure warning buzzer are the additional safety features that comes in all variants. The advance safety-kit that is optional offers numerous attributes like lane-departure warning and pretenses the seat belts, when it diagnoses a collision. What are the colors options available in Volkswagen Golf?